In last week’s crime watch, we begin with the arrest by police of Moses Mande, a laboratory technician attached to Citizen Medical Centre in Kiganda, Kasokoso, Nakawa Division, for allegedly conspiring with HIV/AIDS patients to falsify status certificates in breach of both medical ethical code and the Penal Code. His arrest came after a male counsellor set out to carry out a research into the remarkable rise in HIV prevalence in the area. He then reportedly decided to use the medical centre as a research sample and was allegedly issued with an HIV negative results slip by Moses without taking them through a blood test. According to police, Mande disclosed that some of the couples that visit the clinic to know their HIV/AIDS status have been paying him Shs50,000 bribe to get results, indicating that they are negative yet they are HIV positive in fear of opening up to their partners. Mande was charged with negligent act likely to spread infection of disease and is liable to imprisonment for seven years. 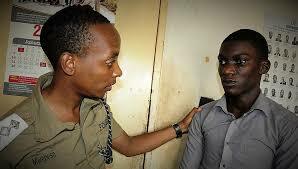 Police also arrested Steven Amanyire,24, a resident of Kasubi following a spate of incidents involving fraud through use of fake Facebook accounts. Amanyire is said to created a fake Facebook account in the names of Mugalanda Cathy Irene (Don), joined different nursing groups and advertised a number of Health Services Commission jobs, claiming to provide connections. 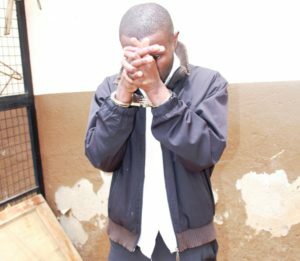 His unsuspecting victims would be then allegedly be tasked to send money on a mobile money number 0788104333 conning an amount of money up to a tune of 15 million Uganda Shillings. He faces charges of impersonation, electronic fraud and obtaining money by false pretense. Police on Friday also arrested Dean Lubowa Sava, a journalist, for allegedly defrauding Shs126 million from people he had promised jobs abroad under unregistered company known as Global Skills International Limited located in Kibuye Opposite MK Building. According to police, the arrest came after over 37 reports of obtaining money by false pretence were registered at Katwe Police Station. Sava is accused of advertising fake foreign jobs on social media platforms like Facebook, promising his clients well-paying paying jobs abroad. Sava is charged with human trafficking and obtaining money by false pretence.